DJ Tira (real name Mthokozisi Khathi) is a South African DJ, entrepreneur and producer/kwaito artist known for launching the careers of artists including DJ Fisherman, DJ C'ndo and Big Nuz through his music label Afrotainment. Originally from Hlabisa, he moved to Durban in 1995 to study Human Resources at the University of Natal. While studying he developed an interest in DJ'ing, bought his first vinyl in 1996 and soon played at varsity parties, weddings, private parties and popular nightclubs. DJ Tira was also part of the team that formed M1 Entertainment, an entertainment company that hosted exclusive parties in Durban. After obtaining his Human Resources degree he tried Public Relations, but later focused his energies on pursuing music and event management. He released the Real Makoya compilation with the late DJ Khabzela and in 2005 formed the group Tzozo & Professor, with Kalawa Jazzmee Records. He is the sole owner of Afrotainment Project Management that releases music by artists including DJ C'ndo, Big Nuz and AfroSoul. 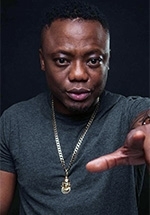 DJ Tira was one of the guest artists (with In-Cha, Jae and Big Nuz) on the third live results show of the reality competition series SA's Got Talent, in its first season in 2009 on SABC2. On 21 January, 2011 he was the guest DJ on an episode of Channel O Celebrity Bassment, which utilised the channel's "visual mixing" technology in which the DJ mixes music videos back to back. In December 2013 he was the first DJ to be featured on the MTV Base music video mash-up show Mixology, in which resident DJs blend and mix club tunes from around the world. On Sunday 3 August, 2014, he was the featured guest on an episode of the e.tv series Rolling With... The Celeb Edition, which taook viewers behind the scenes of his personal and business life. On Monday 23 March, 2015, Tira was one of the featured acts on the second launch night of Mzansi Magic's Big Brother Mzansi: Double Trouble, along with Fisherman, NaakMusiq, Danger and The Dream Team. On 19 June, 2015 he was the guest judge on the Season 2 premiere of the SABC1 DJ talent search 1's and 2's, at the BAT Centre in Durban. In October that year, he appeared on the first episode of the SABC3 show Magic with Mo. On Tuesday 27, October he was part of a team of three DJs (the other two being DJ Zinhle and DJ Vigilante) who did battle for MTV Base against a team from MTV (DJ Shimza, DJ Khenzero and DJ C'ndo), in a special called MTV DJ Battle, which aired on both channels. In 2016 Tira headlined a docu-reality show on Mzansi Magic called Ezase Afro, which went behind the scenes of his label Afrotainment, providing an intimate look at how the company became a success. In September 2016 he was the subject of an episode of the Vuzu Amp interview show The Cover, wherein host Scoop unearths the hidden secrets, stories and skeletons behind celebrities.